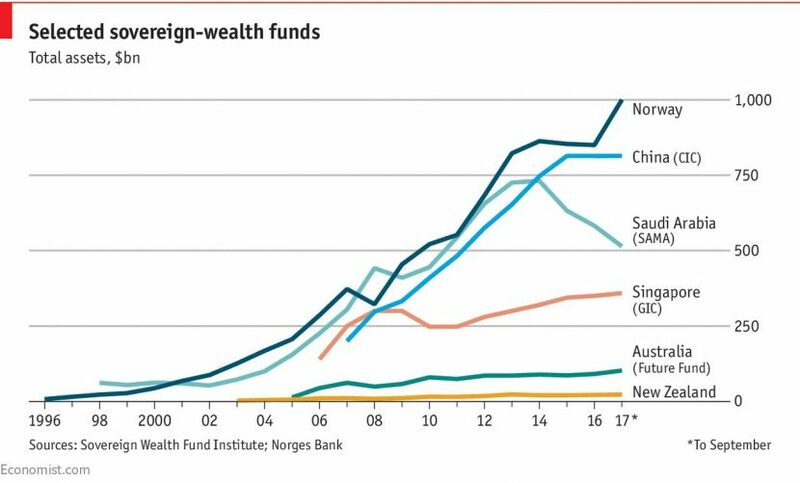 A year earlier than expected, Norway’s sovereign-wealth fund, the world’s largest, surpassed $1trn in assets on September 19th. It had gained over $100bn in the past year, thanks in large measure to the global stockmarket rally in 2017: around two-thirds of its assets are held as equities (over 1% of shares globally). It helps that Norwegians continue to earn large revenues from pumping North Sea oil and gas, which go to the fund to be invested abroad. The fund is so big it is becoming a tool for the 5m-odd Norwegians to shape values abroad. It is an increasingly activist shareholder, speaking out on executive pay, ethical behaviour, companies’ use of water, child labour and more. Both its size and influence are likely to keep on growing. Also seen in the above chart is Australia’s Future Fund, which has grown from the original government contribution of $60.5bn in May 2006 to $133.5bn currently under management. Peter Costello, Chair of the Future Fund Board of Guardians, said during the most recent report: “The Future Fund continues to perform well and has exceeded its benchmark return objective (averaging 7.8%p.a. since inception).” As result of the recent decision by Treasurer Scott Morrison to delay drawing from the fund until 2025-2026, experts now expect the fund to reach $200bn in assets by such time. The fund will allow the federal government to cover their long-term unfunded superannuation liabilities through to the turn of the century.